Keep on Rowland: Maybe I'm Partial, but Im a little proud. Maybe I'm Partial, but Im a little proud. I have been asking one of the guys to come up with a fun post about the Escape Experience to introduce my readers to it, but with the busy time of building out new rooms and just growing the business, it seems like we have all been too busy to take the time to make an introduction post about it. So, Ill do a brief introduction and let the Chattanooga Times Free Press do the talking for me. 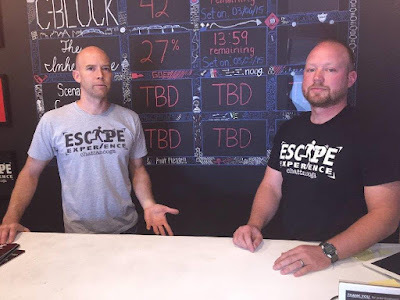 It all began over a burger at Three Brothers Brewery about a year ago when David and Michael presented this "crazy idea" about how they wanted to open an Escape Game business. We all have endless chatter about different businesses we want to open up, so I didn't put too much thought into it, but they were certainly serious about it and continued to pursue it. Long story short, in mid-December of last year, we opened our doors and have been lockin' people up every since. To no credit of myself (except my mad cleaning skills and ability to gather late night dinners from Taco Bell like a champ) the business has not only become an actual business, but had flourished and grown every month of operation. And the excitement continues with my brother in law, Spencer, moving to Chattanooga to contribute his skills to the business as well! Local publications like Nooga.com and Chattanooga Times Free Press have been gracious enough to give us some shout outs and help to get the word out. 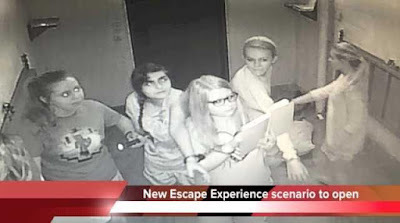 You can also find more information at www.escapeexperiencechattanooga.com or on our Facebook page. So, Ill let the Chattanooga Times Free Press take it from here and basically I'm going to copy and paste their entire article below. #Lazy. Would you pay $28 to be handcuffed to a stranger and locked up in a jail cell with just a 50-50 chance of escaping? Well, two smart young men with MBAs from Middle Tennessee State University are betting that you will. The Escape Experience, one of Chattanooga's newest adventure attractions, is drawing crowds to Rossville Avenue (not to be confused with Rossville Boulevard) in South Chattanooga, largely by word of mouth. Early reports are over the top, with 119 of 122 customer reviews on the travel website TripAdvisor.com giving the Escape Experience a top "excellent" rating. Two Murfreesboro, Tenn., cousins, Michael Rowland and David Rowland, both 33, opened the attraction in a 4,000-square-foot former art studio here last winter, and business has been building ever since. Here's how it works: Players, generally small groups of friends or families, are ushered into one of two secured rooms inside the attraction. One is called "C-Block" and the scenario involves an attempted prison break. By solving a series of puzzles, the "inmates" earn clues that may lead to their escape from a room decorated to look like an efficiency apartment at Alcatraz. They are on the clock and have only one hour to bust out. Only about 47 percent of the teams succeed. The other scenario, called "The Inheritance," has a story line that involves trapping relatives of a rich uncle in a living room setting with instructions to find an unspecified treasure. Only about 27 percent of teams complete the mission in the allotted hour. A third room, involving a scarier scenario (think zombies), is scheduled to open in a few weeks. Meanwhile, members of the Escape Experience staff sit in a control room watching participants on a bank of television monitors — "Big Brother" style — while tapping out text responses to customers' questions on a keyboard. The Rowlands say the games are designed for small groups — up to eight people — and often involve families, friends or co-workers. Groups of two or three are often paired together, meaning that sometimes you play with people you don't know. Reservations, which can be made at escapeexperiencechattanooga.com, are advised. Michael and David grew up together in the mid-state. They both attended MTSU and majored in "concrete industry management," a department designed to groom managers for the construction business. After college and grad school, both settled into regular jobs. For David, a veteran of the Iraq war, it was renovating houses. For Michael, it was building websites. For years, the two had mused about starting a business together. But it wasn't until they visited a popular escape-game attraction in Nashville that they decided to pair up on this new venture. "We saw the success others were having and we were confident we could duplicate it," David says. "We ran the numbers and said to each other, 'We should stop everything we're doing and give this a shot,'" Michael says. "We can't believe we actually did it — especially something as ridiculous as this sounds." Actually, while it might sound ridiculous, their skills dovetailed nicely with the new venture. With their construction chops, the cousins were able to do most of the interior work on the Escape Experience themselves. Michael's website construction skills also came in handy. The two grew up working in grocery stores, so they were both schooled in customer service. They decided Chattanooga was ripe for the Escape Experience because of its central location and established tourist traffic. Because of the nature of the game, repeat visits are somewhat limited, so an ever-churning pool of new customers is required. The cousins say they have plenty of room for expansion if business continues to build, and they're scheduled to open a location in Charleston, S.C., later this summer. Hi Anna, we had the absolute pleasure of attending that "crazy" little business idea by those "two goons" this past weekend. We had traveled down (from the suburbs of Detroit) to attend the premier night at the Caverns, and with a little divine intervention (by way of rain and my own pokiness at trying to book a haunt tour) found ourselves attempting "The Inheritance." Biased or otherwise, you should be proud. The creativity and authenticity present in the Escape Experience room (at least the one we were in) was amazing. And while we didn't escape, we had the most fun EVER doing something in a "tourist town." I'm curious if Michael or David write the scenarios as well. The range of difficulty levels in the puzzles and clues was incredibly appealing - and refreshing as there were a few times I found myself breaking my brain trying to figure something out and moved on to something else a little less mind-boggling. If not Michael or David, whoever DID come up with the "mind games" certainly deserves a serious pat on the back. As an aside - I was so delighted by our experience, that I am in the process of creating a "light" version for our 3 kids (12,11, and 9) for something to do during the day (to keep them busy and channel the nervous energy) of Hallowe'en. Truth be told, I'm also borrowing from a couple of the puzzles and mechanics that challenged us during our experience. Thank you for taking the time to read this... take care, and God Bless.